Just returned from the Paddlesport’s Retailer show in Madison WI. Was really fun to be part of the Northstar Canoe presence especially since the show was in the canoe-loving midwest. As they say, necessity is the mother of invention and Northstar Canoe’s new IXP construction has definitely filled the need for new material for river running and hard rough and tumble paddling. All season, I have had the Phoenix in IXP and have been really impressed to how well it has held up to repping abuse. 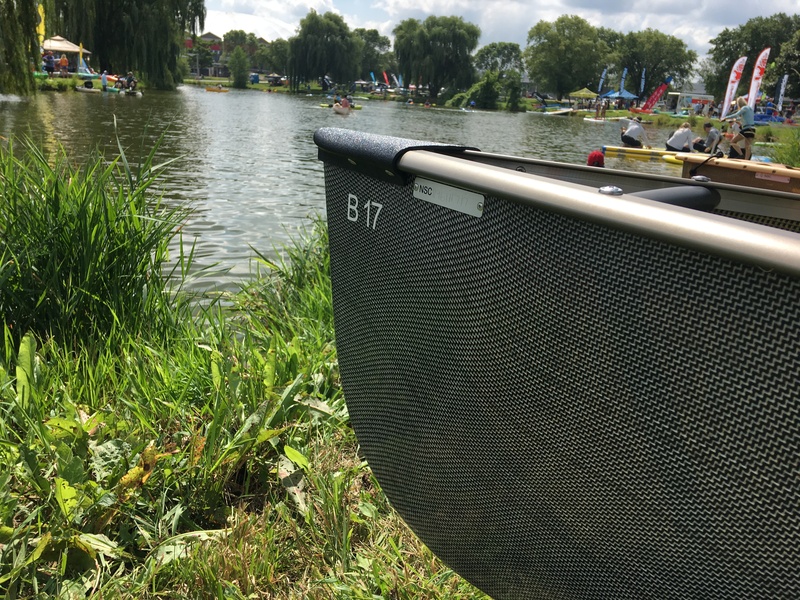 Much lighter than Royalex or T-Formex, I think IXP is the ultimate choice for paddlers looking for an abuse friendly material but with the performance of a true composite boat. No more oil canning! Way better UV resistance than plastics. A better feel on the flat water sections. If necessity is the mother of invention than the loss of Royalex to the community has created one heck of a nicer evolution. Below, you’ll see pics of Northstar’s new river touring model, the B17 in IXP. But first, Northstar allowed folks to bang on the IXP lamination all day at the demo and then 3 days at the show. You’ll see a little mark on the below shot but the pic I took below is directly after the hit. Amazing. You can even hear the comments from the demonstrator. All the industry folks having a good happy hour swinging the mallet on this IXP sample.